Nothing starts your child’s day better than a cup of refreshing milk! During his childhood and teenage years as he continues to develop and mature, calcium is essential to ensure normal bone health and growth, and it has been found that the best sources of calcium are dairy products, including milk! Singapore’s No. 1* UHT Milk – MARIGOLD UHT Milk is brimming with the nutritional goodness of calcium, protein and its unique BonePlus formulation to ensure your child gets all the nutrients he needs for healthy growth. 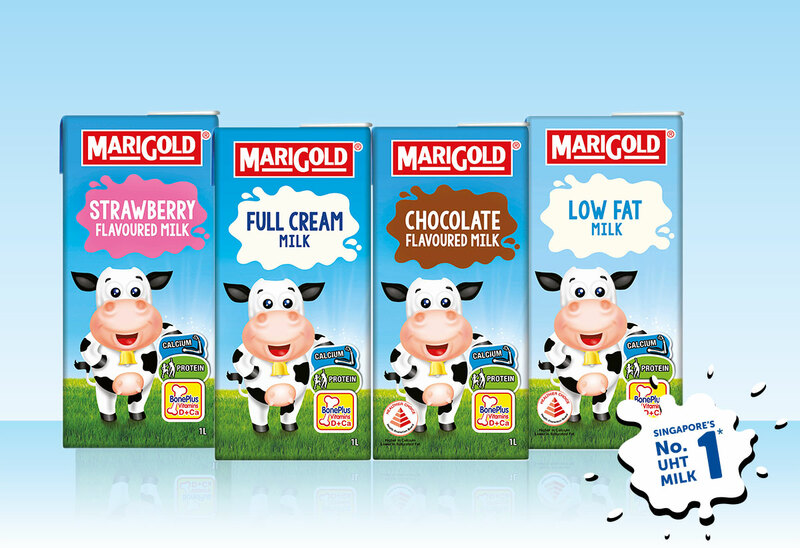 MARIGOLD UHT Milk comes in four flavours – Full Cream, Chocolate, Strawberry and Low Fat – with the Low Fat and Chocolate options packaged with the Healthier Choice Symbol! Whether on its own or with cereal for an extra boost of nutrition, MARIGOLD UHT Milk in the morning starts his day right, and a nice warm mug at night can be what he needs for a good sleep. Other than with cereal or as a bedtime snack, we can think of some other ways your child might enjoy his milk – have you tried using MARIGOLD UHT Milk to make your own ice-cream? Although there is a wide variety of flavours of ice-cream in the market, creating the yummy snack at home with your little ones could be a nice activity to do together on the weekend. Furthermore, you have greater control of what goes into the ice-cream. Here are some simple recipes you could try out! Create ice cream from scratch with simple ingredients such as MARIGOLD UHT Milk, cream, sugar and vanilla extract (watch video for full recipe)! Use honey as a healthier alternative to sugar. Milkshakes are great alternatives to ice-cream as they make less of a mess! Check out the video above for different recipes you can try out. Get your kids to come up with extra ingredients they might want to include in their milkshakes, while using the same MARIGOLD UHT Milk and vanilla ice-cream base. Popsicles are super fun to make and allow a lot of room for creativity and experimentation. They do take time to freeze, so use that time to play some games, with the popsicles as prize! Blend your own mix of fresh fruits for a fresh taste. *Based on Nielsen MarketTrack; sales in Total Singapore for UHT Liquid Milk, Jun 2015 – May 2016 (Copyright © 2016, Nielsen).